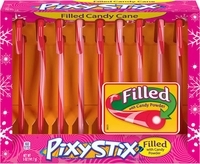 Pixy Stix candy canes are new this year. A cherry flavored candy cane with a powder sugar filling. 9 candy canes per box.